This chapter is the first of two to assess the director’s primary relationship to the actor. It confronts why various understandings of Stanislavski continue to dominate rehearsal practice. The chapter argues that various interpretations and practices as derived from Stanislavski’s work should be understood in a historical context and constitute a form of ‘knowing’. The chapter discusses the contemporised Stanislavskian approaches as practised by Max Stafford-Clark, Mike Alfreds and Katie Mitchell, and whether they should, in fact, even be understood as ‘Stanislavskian’. It argues that Declan Donnellan’s approach to the ‘target’ should be seen as an inversion of normative Stanislavskian processes. 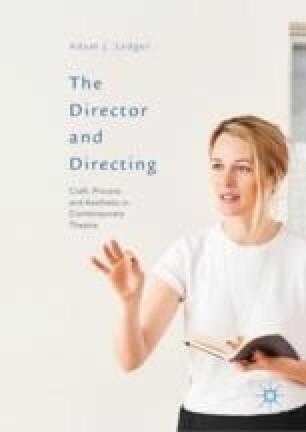 Alongside its criticism of instances where the Stanislavski ‘system’ is reduced to a highly selected, often disjointed approach, the chapter argues that directors create a hybrid, eclectic ‘system’, often drawn from physically based practices elsewhere.